The euro moved largely sideways, leaving our main count wholly intact. Synopsis: By moving below 1.1603 and then 1.1573, EUR/USD is expected to move toward the downside to reach between 1.1528 and 1.1499, while it remains below 1.1724 and ideally below 1.1661. Elliott Wave chart analysis for the EURUSD for 31st October, 2017. Please click on the charts below to enlarge. 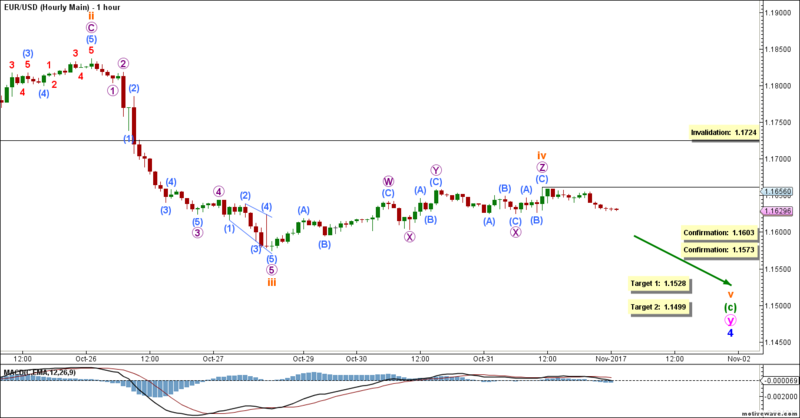 Blue wave 3 formed an impulse labeled pink waves i through v, and reached well over 261.8% the length of blue wave 1. Blue wave 4 is forming a double zigzag labeled pink waves w, x and y. 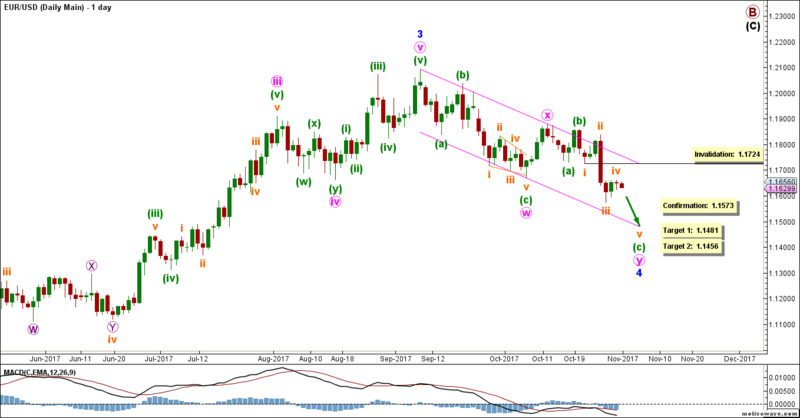 This count expects the euro to continue moving toward the downside in orange wave v of green wave (c) to complete pink waves y, and therefore blue wave 4. This will be confirmed by movement below 1.1573. At 1.1481 blue wave 4 would retrace 38.2% of blue wave 3, then at 1.1456 pink wave y would reach 100% the length of pink wave w.
This wave count is invalidated by movement above 1.1724 as orange wave iv of this lower-degree impulse may not enter the price territory of orange wave i. This main hourly count sees that green wave (c) is forming an impulse labeled orange waves i through v.
Orange wave i formed an impulse labeled violet waves 1 through 5. Orange wave ii formed a zigzag labeled violet waves A, B and C.
Orange wave iii formed an impulse labeled violet waves 1 through 5. It reached twice the length of orange wave i.
Orange wave iv possibly formed a triple zigzag labeled violet waves W through Z. It’s likely complete or very near completion. This count expects the euro to be start moving toward the downside in orange wave v. This will be largely confirmed by movement below 1.1603 and it will be further confirmed by movement below 1.1573. At 1.1528 orange wave v would reach 100% the length of orange wave i, then at 1.1499 it would reach 61.8% the length of orange wave iii. This wave count is invalidated by movement above 1.1724 as orange wave iv of this impulse may not enter the price territory of orange wave i. Once price reaches our confirmation point, we may lower the invalidation point to the end of orange wave iv, which currently stands at 1.1661.